Although limited to its own onboard voices, this Electribe is fun, flexible and capable of some great results. Sounds - contemporary and useful. WAV and Ableton export. Filters. Difficult to use in low light. You could buy an iPad for the same money. Korg seems to be on a winning-streak at the moment - at least in the eyes of retro-fetishists and low-price synth noodlers. Besides introducing the 'fun-size' Volca range, it has reintroduced the Korg MS-20 and is about to bring the ARP Odyssey back from the dead. However, it's not all about hardware as the much lauded Korg Gadget iPad app has proved. One of the most appealing aspects of using knob and fader-laden hardware is the degree of interactivity it inspires and Korg's Electribe range has always embraced this by combining DSP with hardware that encourages a hands-on experience. "We treated ourself to a run through of the 200 factory-loaded patterns, with impressive results from the start"
The Electribe name was first used 16 years ago and one aspect of the original Electribe that has endured is the ability to capture and play back real-time changes to the front panel controls - so-called Motion Sequencing (and later found on the Volcas). As with the ESX-1 and EMX-1 from ten years ago, the latest units are divided between 'sampler' and 'preset' variants. 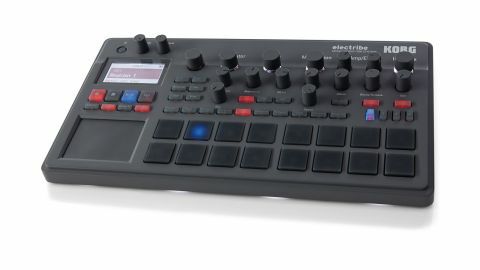 Think of the Electribe Music Production Station as a synth and drum machine with fixed waveforms. Opening the box the most noticeable thing is the modern monochrome design. However, whilst quite slimline and bijou, the unit feels heavy; there's something pretty dense inside, which stops it bouncing across your tabletop as you go fingerpad crazy. A nice bonus is the ability to run it off AA batteries. There is a ten second boot-up delay, but then pressing play immediately gets things started. We weren't quite prepared for the lightshow emanating from beneath the front lip of the unit, but it adds a certain party vibe. Patterns are selected from the main data dial, and can be suitably named, so we treated ourself to a run through of the 200 factory-loaded patterns, with impressive results from the start. This is understandable given that the patterns have been created by some impressive production minds such as Mistabishi and with raw audio content coming from third-party companies Sample Magic, Loopmasters and Prime Loops. It all appears very UK focused, perhaps reflecting the influential melting-pot of British electronica. Creating your own pattern from scratch is simply a matter of finding a free memory slot and pressing record. There are 16 available parts to which a sound can be allocated, and each initialised pattern is conveniently populated with a common electronic drum kit selection assigned to the lower set of pads (numbers 9-16). You also get a four-to-the-floor kick pattern to get you started. Pad pairs 13/14 and 15/16 are initially set to mute/choke each other (this can be overridden) and are commonly assigned to elements such as hi-hats. All other parts are created equally, and with a range of voice priority and allocation modes, but with maximum polyphony of four voices in each case and global maximum of 24. In fact, although the Electribe features both drum and instrumental/ musical sound sources, they are all treated equally for recording, playback and editing. The simplest way to record anything into the unit is in Trigger mode where each pad is assigned to a different part. Press the relevant pad and you can immediately select a different sound for that Part using the Oscillator knob. For those wanting an x0x-style visual grid, the Sequencer mode uses the 16 pads to represent 16 steps at once - pressing a pad toggles that step on or off. Keyboard mode allows you to play different notes on the pads. Clearly this isn't a piano keyboard so you select a Key and Scale type, whereupon you get two octaves or more of correctly-assigned notes across the pads. For those requiring a more ambitious musical approach there is MIDI interfacing on the rear panel (via 1/8-inch socket adaptors) to connect an external keyboard or controller. Chord mode allows each pad to trigger a key-appropriate chord, with editable note complexity. As if that weren't enough, the built-in touchpad provides another means of 'playing' when Touch Scale is engaged. The wide selection of sounds assignable to the Oscillator in each Part (257 drums and 151 others) are only a starting point, as each can be tweaked via the Filter, Amp/EG and Insert FX sections. The Oscillator section provides control over Pitch, Glide and the somewhat enigmatic Edit parameter. This tweaks one aspect of the raw sound, such as detune for some of the basic layered wave shapes, though in many cases appears to apply increasing amounts of distortion. It would have been helpful for Korg to provide more detail here but it's not in the manuals. "Overall this is a little box with some big ideas"
The Filter section is particularly strong, with a host of filter emulations covering some classic kit. Dial-up the Acid LPF and see what we mean. Besides cutoff and resonance there is an envelope depth control that shares the output of the amp envelope to the right. The envelope is a basic two-stage affair. The Modulation section appears simpler than the previous Electribe series, though the Modulation knob in fact allows you to select from 64 different mod source/destination options. There's plenty of choice, but the stripped down interface in this case is less successful in terms of immediacy. Insert FX this time around are not shared between parts, so you have 16 to play with, which certainly makes for a better produced overall sound. On the subject of effects, there is a Master FX slot, to which each part can be sent, and this includes reverbs, delays, modulation and dynamic effects besides some other more interesting types. Its parameters remain largely hidden, though the touchpad can be used for tweaking. The icing on the cake, and where the box really comes alive, is when you start using Motion Sequencing to control most of the front panel controls - it's fun, addictive and sonically worthwhile. This automation is saved with each pattern, and is especially effective when employing real-time insert and master effect tweaks. Also worth mentioning are the Groove parameters, where you can progressively add subtle variations in timing and level. These are set per part and works alongside the global Swing setting to make it very easy to create fluid and interesting patterns from quite simple elements. This Electribe is geared more firmly at live performance than previously, with its ability to trigger finished patterns from the pads when in Pattern Set mode - though be careful not to press this by accident when creating a pattern as you'll lose everything! Incidentally, there is a small playback glitch when writing patterns which precludes using this in a real-time scenario. Another downside for live use is the light-grey on dark-grey button legending, which is difficult to read in low-light conditions. Overall this is a little box with some big ideas. Our reservation about only being able to use preset sound sources was somewhat allayed by the immediacy and flexibility on offer here, though we can't help wondering if Korg will release some 'custom soundset' versions in the future. This Electribe is nearly half the original price of the previous version, but much has changed since 2003 - the iPad for a start. However, as a standalone device, the Electribe Music Production Station is a fun and flexible beast.